One of the biggest criticisms against Sen. Bernie Sanders (I-Vt.) in 2016 was that he didn’t talk enough about race and racism. While he was ever cognizant and well-read on the intricacies of economic inequality, Sanders’ racial analysis, in comparison, was severely lacking for the most part. But on Friday at an invitation-only roundtable focused on criminal-justice reform at Philadelphia Community Access Media, Sanders listened to academics, activists and the new, progressive Philadelphia District Attorney Larry Krasner talk about how racism plagues the city’s criminal-justice system in an effort to better understand the issue. 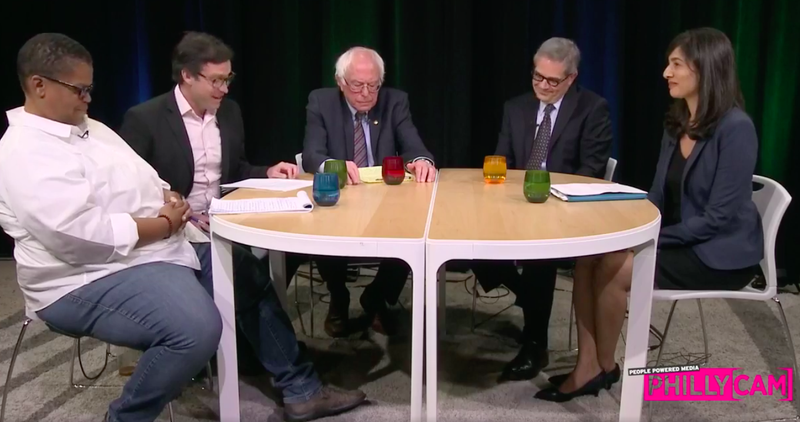 The roundtable is one of the many ways in which Sanders appears to be making up for his shortcomings in 2016. For more than an hour, Jacobin’s Daniel Denvir moderated a conversation between Krasner, Princeton assistant professor of African-American studies Keeanga-Yamahtta Taylor and Director of Litigation at Civil Rights Corps Premal Dharia. Sanders listened a lot and commented when asked. Taylor discussed the ways in which poverty makes minority and poor populations even more vulnerable to the ills of the criminal-justice system, citing racial and “poverty profiling” as primary culprits. Divestiture from public education, hospitals and clinics has also driven and exacerbated poverty, she added. But Taylor stressed that economics and race have to be looked at equally in order to organize the best attack against the reasons people of color are so easily criminalized. Krasner spoke very directly about what he felt has been the racist prosecutorial practices of past district attorneys in Philadelphia. He discussed how Frank Rizzo, a former mayor and police commissioner from the ’60s and ’70s—“a brutal and racist one at that,” Krasner added—allowed white-dominated police organizations to reign with legal abandon. Police officers were able to cover up misconduct and brutality, he said. But under his leadership, the prosecutor’s office is taking a new direction and undoing the legacy of those racist practices. After the event, Taylor praised Sanders for coming to Philadelphia to listen to how racist policing and prosecuting affect people of color. It would not be unreasonable to assume that the Vermont senator appears to be testing the waters for another presidential run. “Much too early,” he said when The Root asked him if he’s running in 2020 as he dashed off to a rally. But it appears that he’s doing something more intentional. Sanders is trying to generate more black support. He lost the 2016 Pennsylvania primary to eventual Democratic nominee Hilary Clinton 55 percent to 43 percent, according to the New York Times; she won 70 percent of the black vote. But Clinton isn’t running in 2020, and Sanders is the most popular politician in America, making him the clear Democratic front-runner if he does decide to run. While popularity doesn’t equal votes, as I have written in the past, the political infrastructure Sanders has built with his organization, Our Revolution, which helps progressive candidates win elected office, has dozens of locals groups around the nation ready to work on his behalf. Not only did Our Revolution, led by Nina Turner, win big in the last election cycle in 2017, but those candidates, many of whom are people of color, are primed to support Sanders in 2020. Basically, his 2020 infrastructure is already taking form. A few weeks ago, Sanders spoke at Rev. Al Sharpton’s National Action Network Convention and was well-received. His appearance was widely viewed as a testing ground to see if there is enough black support for him. It is a well-known fact that it is virtually impossible to win the Democratic nomination without the majority of black support. And whether Sanders acknowledges this or not, his appearances in New York City and in Philadelphia on Friday clearly indicate that he knows that the path to the Democratic nomination will come with black folks’ blessing—especially black women. Sharpton said that Sanders’ appearance at NAN showed that he is making adjustments in how he is discussing inequality. If he does decide to run, Sanders will have to keep doing roundtables like this—focusing on racism—across the nation, and calling it out explicitly. Though one person sitting in the small studio audience on Friday felt that Sanders has been committed to taking on racism in the criminal-justice system from the very beginning. Donte Rollins, who was exonerated in 2016 after spending 10 years in jail for a shooting in Philadelphia that he did not commit, said that he watched Sanders’ presidential campaign from prison and would have voted for him if he could have. Now that he is free, Rollins hopes that Sanders will run again so he can cast his ballot for the Vermont senator.